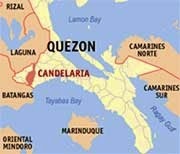 A fake text message warning people of an alleged tsunami has sent residents of Candelaria, Quezon into panic Tuesday, July 22. According to a post on the Facebook page of GMA news program State of the Nation with Jessica Soho, residents in said municipality as well as those living in nearby town Padre Burgos noticed that the water pulled back as if a tsunami was about to hit. Post by State of the Nation with Jessica Soho. Some of the comments on the fan page contained a link to a USGS report about an earthquake that occured 287 kilometers West Southwest of Merizo Village, Guam at 10:49 p.m. Tuesday. Science explains that "due to tectonic activity, an underwater earthquake that ripples through the ocean creates huge tidal waves called tsunamis." However, the Provincial Disaster Risk Reduction and Management Council of Quezon clarified that there was no tsunami warning as there was no prior earthquake, the post stated in Filipino. The PDRRMC reportedly said the big waves were possibly caused by strong winds brought by Typhoon Henry. There were reports that a resident suffered a heart attack after receiving the bogus SMS alert. In an interview on ABS-CBN's morning program Umagang Kay Ganda, Quezon governor David Suarez said the circulating text message about the supposed tsunami in Candelaria was a hoax.